The best for less... In a friendly place! 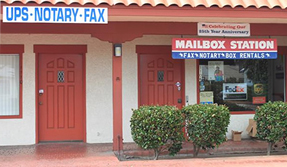 The Mailbox Station has been in business since 1985, providing postal services in the San Diego area with personalized service for all our clients. We providpe affordable mailbox rental, mail forwarding, packing + shipping, as well as many other services to make your business and personal life easier. Street Address - whether for your business or personal use, a street address gives you more flexibility and security. Package Receiving - Unlike a P.O. box, you can receive packages from any courier. No more waiting around for the UPS guy to show up. © Copyright 2019 2013 MailboxStation.biz. All rights reserved.